Epicureans, who celebrated the role that science played in liberating humans from superstition and unnecessary suffering, even had an early theory of natural selection, one that preceded Darwin by almost two millenia. But if we Humanists are to have our own narrative and voice, we must not accept this as the final chapter in the great and glorious history of the school founded by Epicurus, who was considered by his followers to be no less than the salvation of humankind from barbarism and misery. His influence would be evident in the person of Pierre Gassendi, who sought to reconcile Epicurus’ materialism and atomism with Christianity, and then from him it would trickle down to Isaac Newton and eventually to other Enlightenment thinkers. Thomas Jefferson would eventually refer to Epicurus as his Master, a fact which explains his belief –enshrined in our Declaration of Independence– that the pursuit of happiness was inherent to human nature and human dignity. We must therefore not underestimate the considerable influence that this ancient Humanist Cultural Hero had even in our national narrative, the American Dream. 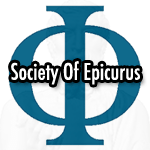 If such was the influence of Epicurus in history and in the progression of scientific thought while being almost invisible, we can only begin to imagine the influence he would have had, had Justinian allowed the philosophical schools to remain open. For years, I told myself: “Wouldn’t it be great if the Epicurean Gardens had remained open, if they were as mainstream today as the churches that we see in every corner?” … and finally this year I decided to become the change I want to see and to found the Society of Friends of Epicurus in order to reinstate the teaching mission of the Gardens and to ensure the cultural continuity of Epicureanism. As I embarked on this process, I’ve enjoyed the solidarity of a small army of bloggers (I like to think of them as our modern scribes) and of philosophers aflame with passion for Epicureanism –people like Dr. Dara Fogel, who authored An Epicurean Manifesto, an article which mirrors exactly how I feel about the need for applied philosophy today and even delves a bit into Epicurean therapy. I was also happily surprised to learn that a blossoming of Epicurean Gardens was already taking place on a global scale. For the last four years there has been a revival in Greece where there are two Gardens with four Epicurean Guides each, and in Australia where there is a Garden in Sydney. Most of the atheists who claim Epicurus are familiar with his trilemma. General consensus is that Epicurus was not an atheist and seems to have believed in the Gods, he simply did not think they were relevant to human happiness and he thought that people’s beliefs about the Gods were all too human and vulgar. Some have argued that he may have feared for his life, aware that Socrates was executed for impiety, and that he was a closeted atheist. We Epicureans generally think that the essence of the teaching has to do with the highest, most progressive humanist ideals and that discussions of Gods are pointless in humanism. The focus on the trilemma does not do Epicurus any justice. The same could be said of the insistence on labeling Epicureanism a hedonistic philosophy without distinguishing between the calculated hedonism of philosophy and the unthinking consumerism of our day, which is the very opposite of Epicurean prudence and frugality. The cultural treasure of Epicureanism can not be encapsulated in the trilemma, or in the pleasures of gourmet food (that other great modern misconception). In his Principal Doctrines 11-12, Epicurus argued for the study of science as a way to emancipate ourselves from irrational fears. For naturalists who don’t believe in gods or spirits, the first two negative statements may be translated as “Do not fear chance or blind luck, for it is pointless to battle that which we have no control over. It generates unnecessary suffering”. We must take philosophy back from academia and bring it into our daily lives. We must again transform the dry, abstract field that has become Love of Wisdom back into a pragmatic cultural pursuit so fundamental to our species, that without it we would not be human. For what is the homo sapiens without the sapiens? We’re just another brute hominid without philosophy.